Our journey begins at the esoteric St. Peter Cemetery, the city's hidden and oldest burial site. After learning about the St. Peter Cemetery, walk with one of our expert historians through one of the most visited cemeteries in the country. We meet at our French Quarter shop located at 626 North Rampart St. Our shop is built on top of the old St. Peter Cemetery...the oldest cemetery in New Orleans. After learning about the St. Peter Cemetery and the Pool of Souls we walk a short 2.5 block to St. Louis Cemetery #1. En route we stop in front of the old mortuary chapel...one of the iconic churches that marked the farewell to many of our ancestors. Per the Archdiocese of New Orleans all participants must stay with the tour guide. Participants aren't at liberty to wonder around the cemetery unsupervised. In the cemetery we will share our burial traditions, i.e. how we can fit 50 people in one small family tomb. We will also walk the cemetery and learn about some of the most important historic figures in New Orleans history. You will unavoidably recognize x's on some of the tombs. This is part of the VooDoo history and culture of our city. You will learn how New Orleans VooDooism was formed and visit the iconic tomb of Marie Laveau. 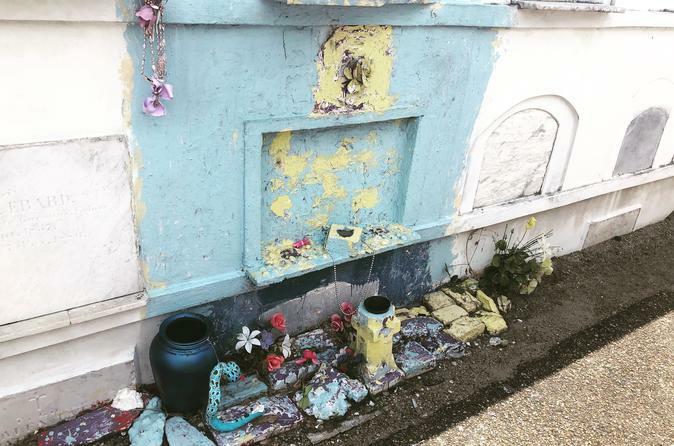 Visitors to the cemetery are restricted from leaving offerings at Marie Laveau's tomb. But don't worry, we have you covered. We will give you the location of her shrine where offerings are welcome. The tour will end on the outside of the cemetery gates.